Look, debate amongst yourselves all you want: McDonalds vs. Burger King, Shack Shake vs. Five Guys, Wendy’s vs. Jack In the Box. Leave me out of it. In this debate, I’m a lover, not a fighter. Just get me to In-N-Out, my Southern California comfort food feeding trough. When I fly home to Orange County, my first stop from the John Wayne Airport is In-N-Out. Go ahead, ask my mom and dad. In-N-Out is owned by the descendants of its founders, Harry (1913-1976) and Esther (1920-2006) Snyder. It does not franchise – no matter what the offer. The company is worth about $3 billion and CEO Lynsi Snyder is the 36-year-old granddaughter of the founders (most recently on the cover of Forbes). The company routinely gets offers to go public or sell. “We’ve had some pretty crazy offers,” Snyder told Forbes. “There’s been, like, princes and different people throwing some big numbers at us where I’m like, ‘Really?’ ” The plan never changes. “We will continue to politely say no to Wall Street or to the Saudi princes. Whoever will come,” says In-N-Out. In-N-Out has a few defiant trademarks that are counterintuitive but serve them well: one of them is that In-N-Out serves fewer than 15 items: burgers, cheeseburgers, fries, soda, milk shakes. It only just added hot chocolate. 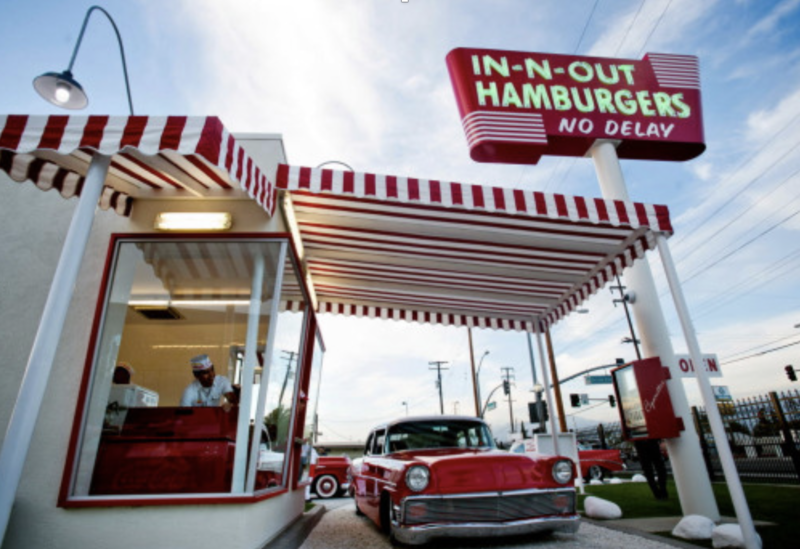 • In 1948, it was one of California’s first drive-thru joints. • Harry Snyder built his own two-way speaker system in his garage to take the drive-thru orders. • Opening day menu was hamburgers, 25 cents; cheeseburgers, 30 cents; fries, 15 cents; and bottled soda, 10 cents. • The iconic crossed palm trees logo was inspired by one of Harry’s fave movies, “It’s a Mad, Mad, Mad, Mad World.” The 1963 film features a car chase to reach the palm trees and buried treasure. Harry Snyder was also part owner of the Irwindale Raceway. In-N-Outs became a hangout for hot rod racers (CEO Lynsi Snyder is also a former drag car racer). • In-N-Out lists six items of its “not so secret menu” on the company website. Animal Style is the hamburger patty grilled with mustard and served with grilled onions, extra spread and the usual toppings. “Protein style” is lettuce leaves, no bun. • In-N-Out has become a fixture at Oscars after-parties. • There are Bible verses inconspicuously found on the packaging. • In-N-Out has been referenced by a few hip-hop artists such as “Cadillac Girl” by Andre Nikatina and Dr. Dre, as well as “Not Going Back” by Childish Gambino. • The business is debt free. Seventy years of smart business and tasty food. Congrats. Nothing but love and respect. For further info, check out “In-N-Out Billionaire Lynsi Snyder Opens Up About Her Troubled Past And The Burger Chain’s Future” in Forbes or “70 fun facts about In-N-Out Burger in honor of its 70th birthday” in the Orange County Register or the Sacramento Bee.